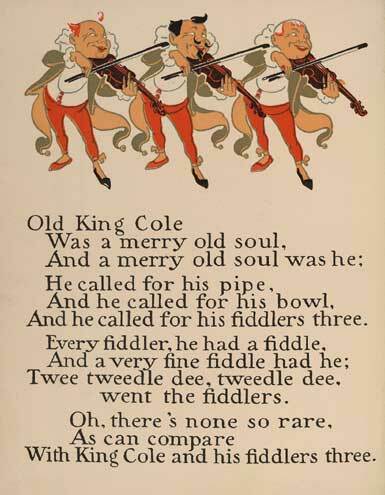 While we know that Old King Cole was a merry old soul with a love for music, whether he actually existed is a matter of some debate. There are records of a few different British rulers named Coel, dating back to the first century AD. The most famous, and also the most likely to have really been a historical figure, was Coel Hen, or Coel the Old. He would have lived around the fourth century, and is thought to be the last of the Roman rulers in Britain. His kingdom would have consisted of parts of northern England and southern Scotland, with the district of Kyle in Ayrshire, Scotland being named for him. A connection to Colchester has also been proposed, but apparently it’s more likely to have been named after the River Colnes. Geoffrey of Monmouth wrote that a King Coel was the grandfather of Emperor Constantine, although this presumably wouldn’t have been Coel Hen. I’ve also seen suggestions that Coel Hen was the ancestor of both King Arthur and Merlin. This genealogy makes Merlin’s father a man named Mor, so it presumably doesn’t go along with Merlin being the son of a demon, unless there’s some information about this Mor to which we’re not privy. Regardless, it might be best to look at the various Coels as along the same lines of Arthur, as possible historical figures who have been heavily mythologized. The rhyme, therefore, would be looking back at a legendary British past. By the way, I’ve seen it suggested that the pipe and bowl are actually musical instruments, hence making music the theme of the rhyme in general. After all, smoking had not been introduced in Britain at the time of the Coels. Regardless of the historical reality, King Cole has made quite a name for himself in fiction. In L. Frank Baum’s Mother Goose in Prose, Cole was the poor son of an apple peddler who had nothing but a donkey and a fiddle to his name until he arrived in Whatland. Here, the old king had died, and the law stated that the prime minister would go out blindfolded into the main street of the capital city while blindfolded, and the first person he touched would become the new king. Baum would later incorporate a similar idea into his Queen Zixi of Ix, in which a king of Noland who died without an heir would be succeeded by the forty-seventh person through the gate of the city of Nole. Getting back to Cole, he was obviously the first person the prime minister touched, and he made an unorthodox but beloved monarch. 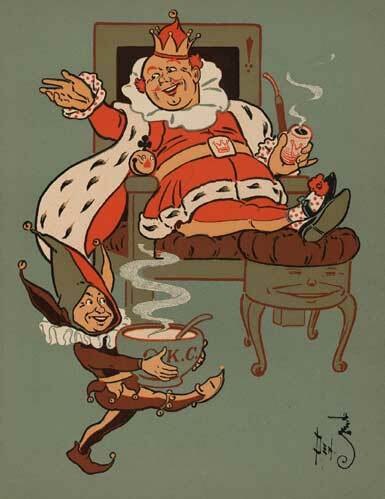 In Baum’s take, the pipe was of the smoking variety, and the bowl was full of punch. Fables makes King Cole an experienced statesman who serves as Mayor of Fabletown. Prince Charming temporarily took his office, but tired of it and gave it back. And in Robert Rankin’s The Hollow Chocolate Bunnies of the Apocalypse and The Toyminator, Cole is the King of Toy City, which appears to be essentially an honorary position. We learn that he’s a big fan of jazz music, and that he wrote a self-help book. This entry was posted in Authors, British, Comics, England, History, L. Frank Baum, Mythology, Nursery Rhymes, Oz, Oz Authors, Robert Rankin, United Kingdom and tagged bill willingham, coel hen, constantine, fables, geoffrey of monmouth, king arthur, merlin, mother goose in prose, old king cole, the hollow chocolate bunnies of the apocalypse, the toyminator. Bookmark the permalink.